Bai Tu Long cruiser is designed based on traditinal style of chinese Junk in 14th century with 9 fully equipped , air-conditioned cabins, attached with private bathroom, hot water shower, a closet and night table. In each cabin, you enjoy the elegant design of the fine woodwork that is evident throughout. For your convenience, there are also 3 shared bathrooms onboard including on the dining deck. 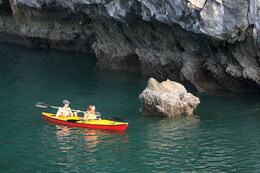 Cruising, swimming and kayaking in the crystal waters of Ha Long Bay. Visit Sung Sot cave and Titov Beach. 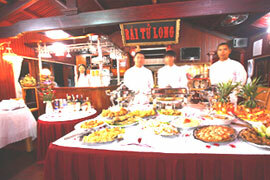 Tour Map: Hanoi – Halong Habour – Sung Sot cave – Titop Beach – Luon cave - Halong Habour – Hanoi. 12.00 Arrival Hon Gai - Ha Long city – Break and photo shooting. 13.30: A fantastic cruise on the bay, passing Dinh Huong Island, fishing villages, Ga Choi Island, Dog Island, Sail Island, and explore the mystery of Sung Sot cave. 07:00: Early in the morning- Tea, coffee and cake will be available. 12.00: Back to Halong city, the van picks up to come back to Hanoi. 16.00: Arrival in Hanoi. End the trip. Tour Map: Hanoi – Halong Habour – Bai Tu Long bay – fishing village - Halong Bay - Sung Sot cave – Bai Tu Long Bay - Halong Habour – Hanoi. 13.30: Stop over in Dong Trieu town for visiting Ceramic workshop. Playground: 30m2. Spacious enough for 20 peoples. Sun lounge:40m2. It is an idea place relaxing and sun bathing.